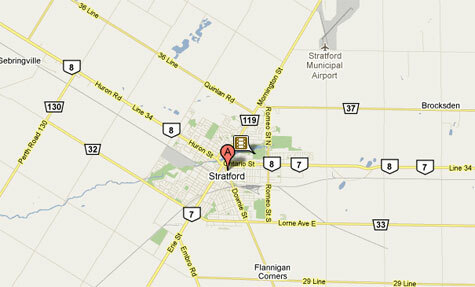 Ontario’s small town of Stratford was recently chosen as one of the top 7 intelligent communities of 2011 from around the world. It might surprise many Canadians to learn that the town that is well-known for attracting a large amount of tourists to the Stratford Shakespeare Festival every year is now becoming a technologically advanced community. Although Stratford’s population is just roughly 32,000 people strong, the town is a glowing example of what’s possible for Canada’s digital future. Stratford has recently undergone significant changes in order to boost the local economy and create new jobs and opportunities in the information technology space. Not only has the University of Waterloo recently opened up a campus in Stratford to offer a Masters of Business Entrepreneurship and Technology program but the city has also laid 60 km of optical fibre to provide a public Wi-Fi network. In addition, a digital media “think tank” centre, the Stratford Institute, was recently developed to host seminars, workshops and presentations led by some of the brightest minds in the digital media industry today. What is most impressive is the fact that Stratford’s family physicians have been experimenting with an e-health portal to manage their patients’ health records and after-hours care. This has enabled the town to make-up for the shortage of local family doctors and has made Stratford a leading city in the e-healthcare industry. Stratford has also played host to the Canada 3.0 conference in the past two years. I am excited to be a part of this conference in 2011. The agenda for this three-day event starting on May 2nd will explore many of the current trends and challenges that Canada faces in order to become a leader in technology innovation on the world stage. The conference will bring together leading industry experts, policy makers, Academia, decision makers and Government representatives to discuss and collaborate on the current issues that will help Canada reach a “moonshot goal” – that anyone can do anything online in Canada by 2017. I will explore some of these issues over the coming weeks to find out what other Canadians think it will take for Canada to reach this goal. There are many challenges to overcome in order to achieve the “moonshot” goal in such a short time. Therefore, Canada requires anyone with a strong voice and the willingness to collaborate to participate in the conference and in the efforts required to elevate Canada’s global status as an innovator in technology. This year’s conference will cover keynotes, breakout sessions, expert panels, and open dialogue regarding current digital media-driven productivity gains in the Education, eHealth, Media & Entertainment, Natural Resources, Public Sector, Research and Telecommunications & Distribution industries. If you have suggestions for current Canadian technology trends and issues in those sectors that are worth exploring, definitely let me know and I will consider writing about them. Let’s get the conversation started now. I hope to see you in Stratford in May to help build the roadmap for Canada’s digital future. For more information about the Canada 3.0 conference in Stratford, visit www.canada30.ca.